Student teaching has challenged me in ways that I never could have imagined! I truly must believe in myself, because we all know that the students in my classroom will be able to feel if I do not believe in myself. Over the past four weeks, I have lived into my role as a student teacher. 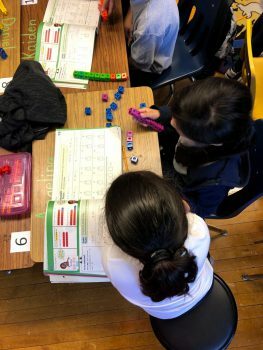 I have fully taken over math and social studies instruction in my classroom, and it truly feels like my mentor teacher and I have been co-teaching for years. It’s so natural! Our students definitely make it easy on us because they are rock-stars, but I can honestly say I have never had more fun teaching in my entire life. Like I mentioned above, I am entering my fifth week of student teaching. I am beginning to teach and videotape my lessons for my edTPA certification process. While it is scary and nerve-wracking, I must remember to believe in myself and my ability to know my students well. I am eager to update you on how my edTPA lessons went in my next blog post! In my last blog post I mentioned that I live “off-campus.” Because of this, I had no idea what the other Chicago Semester student’s apartments looked like! I am someone who feels like they can learn a lot about a person by seeing the space in which they live. 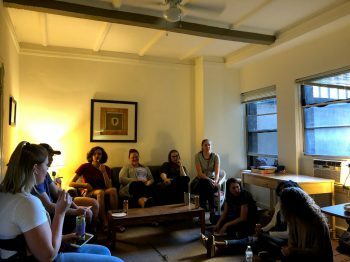 Fortunately, every semester the Chicago Semester Program puts on a progressive dinner where we can eat some delicious food while going on a mini-apartment tour! This was an especially fun time for me because I was able to connect with my peers who are in different majors. Every week I am blessed with my time spent with my fellow student teachers, but I do miss the friendships I made during the first few days of orientation. The progressive dinner was a fun way to reconnect with these friends, and I am excited for more opportunities to see them at future art events! Please send all of the love and air hugs as I go into this next week. While I am so nervous to teach my edTPA lessons, assume more of a full-time teaching role (taking on THREE subjects), and give progress reports to my students… I know it will be such a fruitful learning experience.